James Norwood has now scored 14 league goals this season. 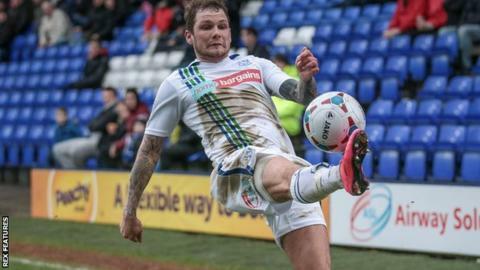 Two first-half penalties from James Norwood strengthened Tranmere's grip on a National League play-off spot as they beat Gateshead. Jon Shaw handled Adam Mekki's cross in the area and Norwood converted the spot-kick to give the hosts the lead. Mekki was then brought down in the box and Norwood once again scored the penalty to double the advantage. Michael Higdon nodded in the third, before Danny Johnson grabbed a consolation late on. The win sees Rovers consolidate fifth place, with sixth-placed Wrexham now four points behind. Gateshead's hopes of a play-off place remain intact as they sit in ninth position, five points behind Tranmere. Match ends, Tranmere Rovers 3, Gateshead 1. Second Half ends, Tranmere Rovers 3, Gateshead 1. Substitution, Tranmere Rovers. Jonathon Margetts replaces Adam Mekki. Attempt missed. Josh Gillies (Gateshead) right footed shot from outside the box misses to the right. Substitution, Tranmere Rovers. Gary Taylor-Fletcher replaces Michael Higdon. Attempt missed. Lee Vaughan (Tranmere Rovers) right footed shot from outside the box is too high. Substitution, Tranmere Rovers. Jack Mackreth replaces Jake Kirby. Attempt saved. Danny Johnson (Gateshead) right footed shot from outside the box is saved. Foul by Michael Higdon (Tranmere Rovers). Andre Bennett (Gateshead) wins a free kick. Goal! Tranmere Rovers 3, Gateshead 1. Danny Johnson (Gateshead) right footed shot from the centre of the box to the bottom right corner. Attempt saved. Patrick McLaughlin (Gateshead) right footed shot from outside the box is saved. Substitution, Gateshead. Matty Pattison replaces CJ Hamilton. Attempt saved. Adam Mekki (Tranmere Rovers) right footed shot from outside the box is saved. Alex Whitmore (Gateshead) wins a free kick. Attempt saved. Jake Kirby (Tranmere Rovers) right footed shot from outside the box is saved. Substitution, Gateshead. Jamie Chandler replaces Rob Ramshaw. Alex Whitmore (Gateshead) is shown the yellow card for a bad foul.